The web is full of theories, opinions and discussions about the differences and similarities between certain poppers. One of the things people ask us most about is the difference between the Rush Special EU Formula and the Rush Ultra Strong. To try to answer this question, we have looked at both poppers and here are our conclusions. 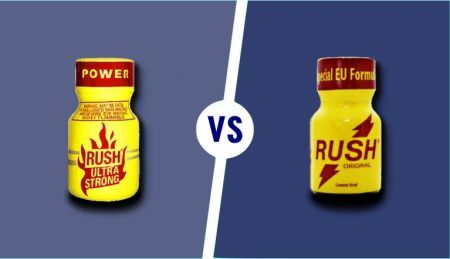 First, both the Rush Special EU Formula, created according to the preferences of European customers, as well as the Rush Ultra Strong are both Pentyl Nitrite poppers. But the similarities do not stop here. After analysis, we contacted the manufacturer (both poppers are made by Lockerrom) and confirmed that, not only the base is the same, but also the formula is EXACTLY EQUAL on both bottles: pentylnitrite, di-sec butylcarbinol, 1-pentanol. Thus, the experience of using one or the other is at all identical and both poppers present the same duration, intensity and strength. But anyway, you do not have to take our word for it. You can check for yourself by buying any of these poppers (and many more) at our Buypoppersnet.com online store.